Home Dresses	White hot leather mini! Why hello there! I hope everyone’s been enjoying their autumn, and you’re all gearing up for some Halloween festivities this week! I’ll probably be hunkering down at home, donning sweatpants, and curling up with a giant bowl of popcorn and some knitting to watch a lame, not-so-scary scary movie (because I’m a giant wuss). We are just party animals over here! I’ve been pretty excited that the weather here has decided to cool down just a smidgen so I can start pulling out all the lovely, heavier weight fabrics I’ve been hoarding since late summer. I was absolutely ecstatic to see Mood Fabrics online stocking leather hides a few months ago, because leather has got to be one of my most favorite materials to work with, and wear. Of course, if real leather is not your thing, Mood also carries an impressive selection of faux leather, which is just as fun. 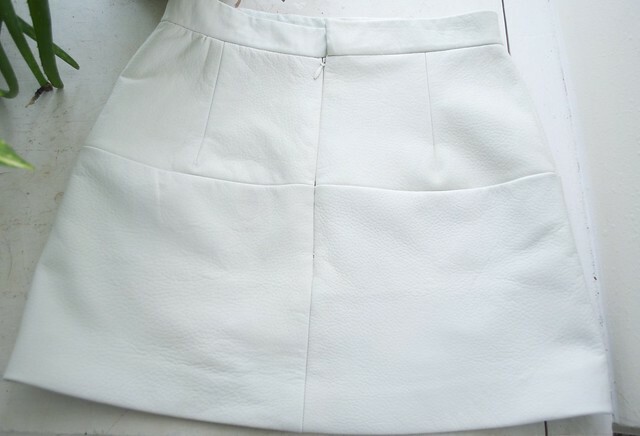 Many of the real leather hides got snatched up pretty quick, however I was able to get my paws on two hides of this gorgeous ivory deer leather, which I used to make this cute little miniskirt. This leather was absolutely sublime! It was smooth and buttery, with a lovely drape, and the back side was softly sueded. Of course, because it’s a natural material, there were some slight variations on the surface, and a slightly subtle difference in color between the two hides, but that is to be expected, and isn’t anything that I couldn’t work with. As a matter of fact, those little oddities are one of the reasons I love leather so much! It has character! I used Vogue1247 for the pattern, which I’ve already made once before (here). I love this pattern, I just think it’s so flattering! Of course, it is short, but I’ve never been shy about showing a little (or a lot) of leg! I changed a few things on the pattern to make it more suitable to being made up in leather. 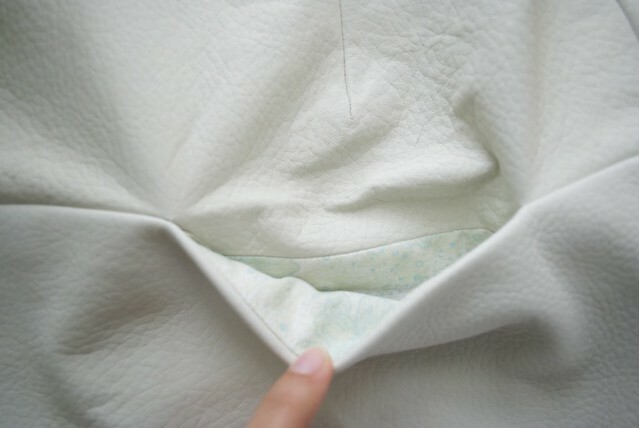 For instance, the pattern calls for self-fabric pockets, which are an extension of the front yoke. However I decided to cut the pocket as a separate piece out of some quilting cotton so I wouldn’t have four layers of leather to deal with! I also sewed the interior of the waistband in the same quilting cotton, and drafted a lining for the skirt. I was sorely tempted to just keep the skirt unlined because the sueded side of the leather was seriously so soft – I couldn’t stop touching it! In the end I decided it would be more practical to line the skirt, since I plan on wearing it with tights this winter. I used some leftover royal blue rayon bemberg from Mood online (all sold out, but check out all their lining fabrics here) for a nice contrast in color. 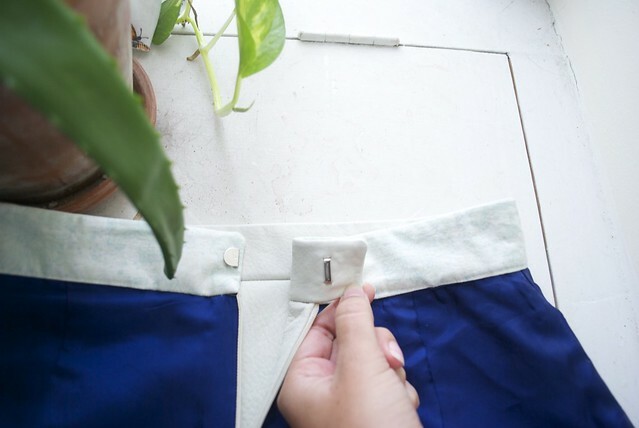 I used rayon seam binding to hem the skirt – machine stitching it to the right side of the leather, folding it up, easing in any fullness, and catch stitching it to the lining, just barely catching some of the sueded nap of the leather. 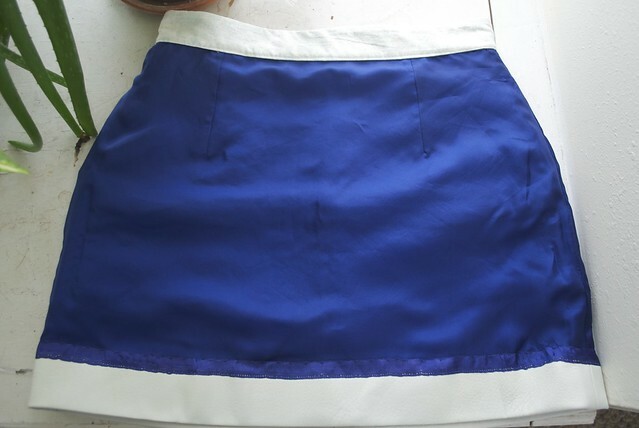 Of course, I could have simply cut the leather to my desired length and called it a day, since I wouldn’t have to worry about fraying, but I liked the substantial look that a folded hem gave the skirt. I used a set of no-sew hook and eyes for the waistband, which have pointy metal prongs that you push through the fabric and hook around a metal plate, concealed between the layers of fabric. This was ideal for such thick material, especially one that would be a pain to try to work teensy hand stitches into. Plus, it gives a nice, clean, RTW touch. Leather does have a ‘grain’ so try to cut all your pieces going in the same direction, and avoid cutting anything too close to the edge of the hide, as this area tends to be the weakest. Use a walking foot, or teflon foot, if you have it. Using a leather needle isn’t necessary but it does make for a nicer looking stitch. I press my leather using a dry iron with high heat, and a press cloth. I’ve read differing opinions about this online, but it works for me. I also use iron-on interfacing where necessary. For areas where you can’t use a walking foot – like when you’re installing an invisible zipper – try backing the seam you’re sewing with painters tape, or even paper, to prevent the leather from dragging. And that’s it! Other than that, keep it away from water, and treat it just as you would any other fabric! What are your tips for working with leather? If you haven’t already given leather a try, I hope you will! Happy Sewing, everyone!